22 makeup-free selfies from celebs who are obviously better than us. Posting a makeup-free selfie is the ultimate #humblebrag. Not only are you showing the world that you have a flawless complexion of an American Girl Doll, but you are also proving that you have enough confidence to put your naked face out there for all of the world to judge see. Do we sound bitter and jealous? This is because we are. Of course, no one is perfect, but these 22 celebrities who dared to post makeup-free selfies come pretty damn close. Lopez is turning 48 next year and still has the skin of an 18-year-old who drinks a lot of water. The 19-year-old Modern Family star loves to show off some skin, including the skin on her face. Ariel Winter's co-star looks like she could play her big sister sans makeup. We are happy to report that the journalist DGAF about being "camera ready" 24/7. It is easy to make fun of Gwyneth Paltrow and her impressive lack of self-awareness. Alas, this picture proved that GOOPing actually works. Skin so nice it makes you want to jump on Oprah's couch. There's something about Mary...and that something is that she may be an alien who doesn't age at the same pace as humans? Okay, now this just isn't fair. The Orange is the New Black actress slays with or without makeup. Also—THOSE CHEEKBONES! Tyra always looks like a top model, whether she is wearing makeup or not. 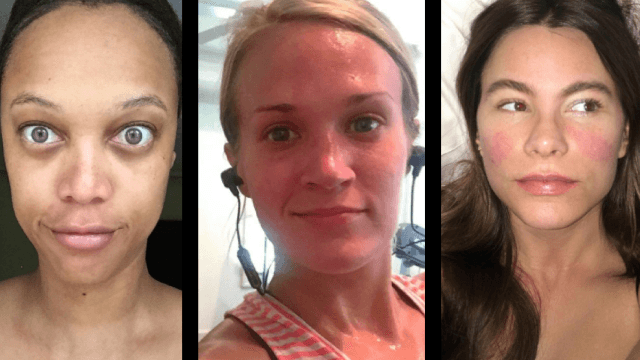 Carrie Underwood looks better red and sweaty than most of us do on our best day. She still looks young enough to have her own Disney channel show. Keys has gone completely makeup-less for a while now. Here is a picture to remind you how amazing she looks without even trying. She looks radiant without makeup. The rest of us look like ET. The trees view of me. I don't know if your like me, but I spent my whole vacation "leaning in" with my kids. As if the entire time is about them. That's what a "family vacation" is. You, trying to make everything perfect for them. The kids. But! If you find a "mom moment" or a "solo moment"... relish! Cherish! Recognize! How wonderful that quick fix is. And hold on tight because it's gone before you blink. But I wouldn't have it any other other way. You don't need highlighter when you've got that Olympic gold glow. As her former BFF Paris Hilton would say: "That's (still) hot." It's almost been 20 years since Prepon debuted as Donna on That '70s Show, but she still can pull off that 'girl next door' look. The Wonder Woman actress and mother looks super without makeup. This Disney channel star still looks like a fresh-faced teen despite being the ripe old age of 20. She may be a housewife, but she certainly ain't desperate. The queen of the cat eye looks just as fierce without makeup on.